A business lunch with colleagues from Dundee and a suggestion to meet halfway between Aberdeen and Dundee to save on travelling seemed like a sensible idea. The coastal town of Montrose sounded the ideal location and we were recommended Roo’s Leap. I had eaten there before when my children were younger and I remember the food being good, but as it is a very popular family restaurant would it be okay for a business meeting? I needn’t have worried; the young lady who took my booking said she would make sure of a quieter table and we wouldn’t be asked to leave straight after our lunch. 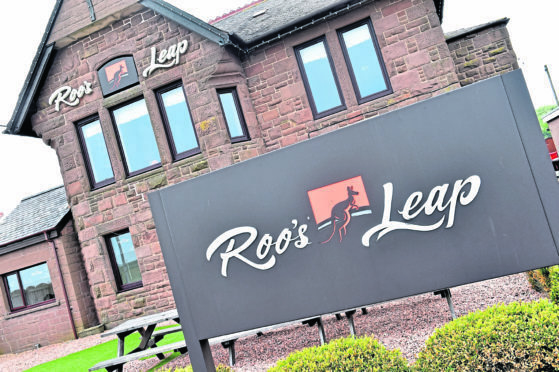 Roo’s Leap is situated right next door to Montrose Golf Club near the beach. The restaurant has an Aussie theme and the impressive entranceway has 3D kangaroo statues and splendid aborigine décor. The eating area is upstairs, but unfortunately there are only a few tables from where you can admire the fabulous view as the restaurant stretches quite far back. 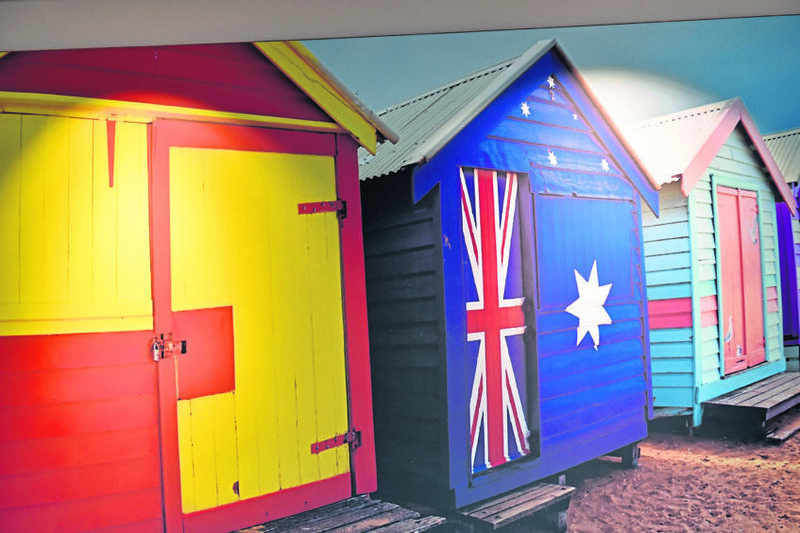 However, the room is big and bright with funky lime and orange seating and more colourful artwork featuring beach huts and Australian landmarks as well as a stunning white ceiling light featuring kangaroos. They have a small lunch menu or you can choose from the extensive main menu, but they can also do a half portion of anything from the main menu for a reduced price – choices galore! We were glad to see there was no ostrich or kangaroo on the menu, but they have so many mouth-watering dishes on offer from salads to gourmet burgers, Mexican to steaks. 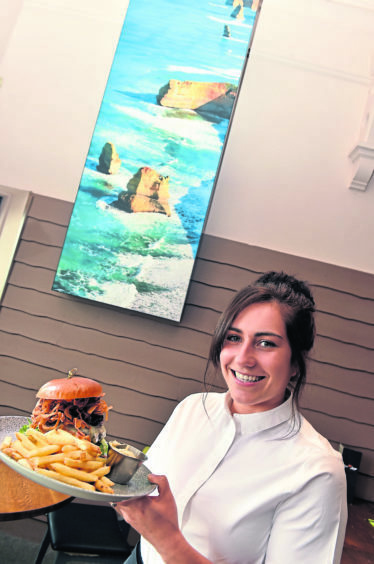 The menu states that they cook all of their burgers and steaks on a special jasper grill which ensures the meat retains moisture and flavour as it cooks with charcoal at temperatures over 400 degrees centigrade. 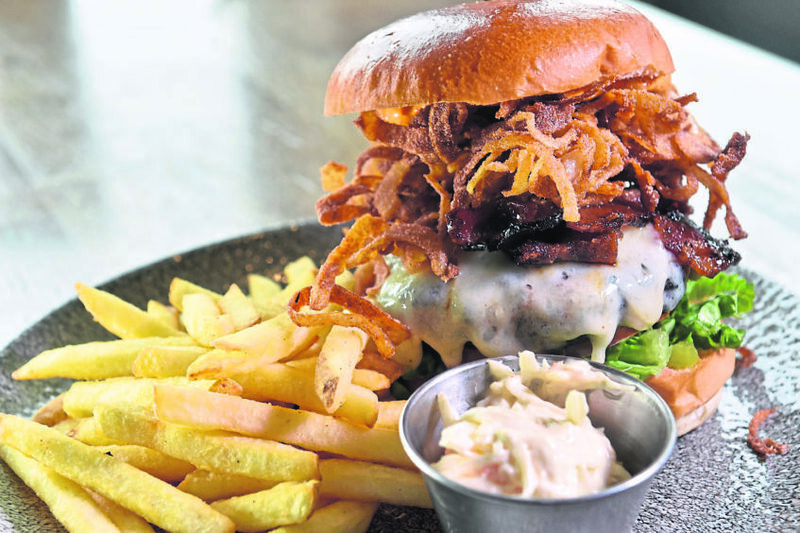 To put this oven to the test, a few of us chose the Dirty Spaniard burger from the lunch menu which comes topped with Spanish Manchego cheese, sweet candied bacon, crispy fried onion strings and spicy mayonnaise. My other colleagues went for a Caesar chicken wrap and a half portion chicken satay. If you have ever been to Florida on holiday there is a well-known Aussie steak restaurant called the Outback Steakhouse and their speciality “Aussie-tizer” is a bloomin’onion which is an onion hand-carved then cooked until golden. I was delighted to see that Roo’s Leap has a similar offering called an “awesome onion blossom” and we ordered it to share before our main courses. And indeed it tasted awesome. Served with a slightly spicy accompanying dipping sauce the crispy onion was just divine and incredibly moreish. Swiftly followed by our main courses we all eagerly tucked in to our well-presented dishes. The burgers were fabulous, served in my favourite brioche bun with a small side salad. The burger really did taste like it had come straight off the barbecue and the crispy onions provided a nice crunch to the dish. 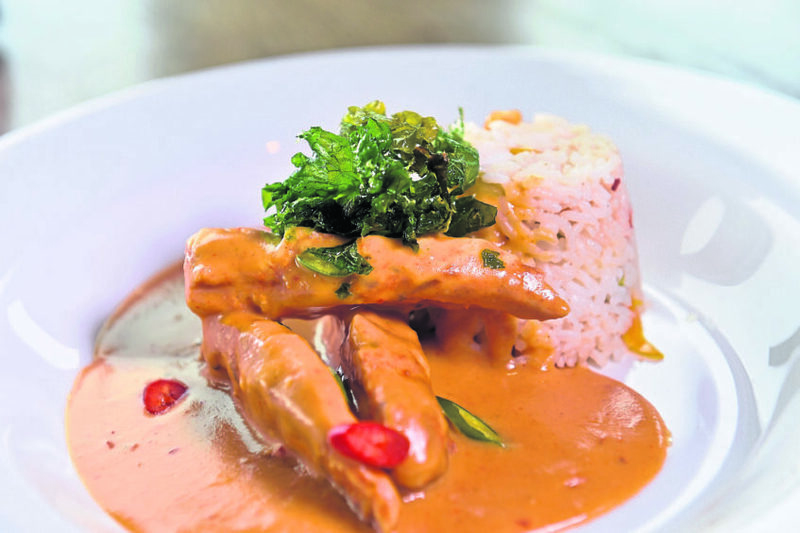 My colleague’s half portion of creamy chicken satay, served with vegetable rice was declared the best satay she had ever eaten, while the wraps at the other side of the table were packed full of filling within the soft flour tortilla. We had ordered some sweet potato fries to share and also some tempting halloumi fries. I love cheese and I love salt (in moderation of course!) 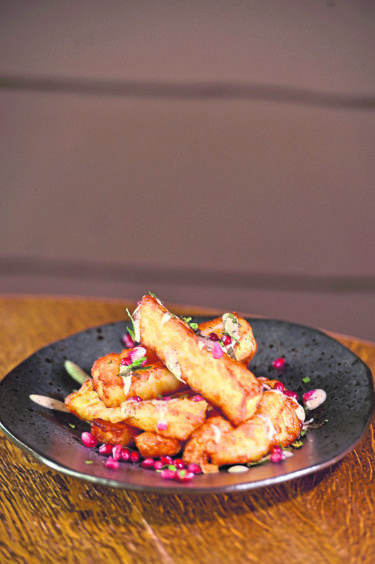 so the Cypriot-origin squeaky halloumi cheese is a winning combination, while the accompanying yoghurt and pomegranate gave the dish a light and fresh feel. We skipped on desserts but I had a glance at the delights. I have never tried sweet nachos before – home-made sweet cinnamon nachos served with toffee apples, caramel sauce and ice cream. This sounds like a creation that could easily justify a return visit. We sat for some time carrying on our meeting and the staff were friendly and attentive throughout as we ordered more coffees and soft drinks. For a lunch-time the place was fairly busy and I imagine weekends will be full of families having a good time. The kids’ menu, Joeys Corner, offers a great selection for young diners and they even present drumstick lollies with the bill. Unfortunately it is back to my usual boring sandwich and yoghurt at my desk again, but we’re planning another meeting as soon as possible in sunny Montrose. They have another similar- style restaurant in Aviemore which I am sure will be as “dinkum” as this one – may need another meeting just to check!